Choosing to start a business in Osoyoos is an easy choice. The community has so much to offer, from existing commercial buildings to small homes which can be converted into retail spaces to empty parcels waiting for a building to be constructed on them. 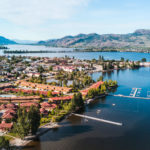 If you’re looking for a location to start your business, be sure to view the commercial real estate listings in Osoyoos. A listing of real estate agents can also be found on the South Okanagan Real Estate Board website.